When I was a kid growing up in South Otago, my family would go to the Rosebank Lodge for a meal on special occasions, especially around Christmas. One of the highlights was the special parfait dishes with traffic light jellies in them, suitably festive with their red then orange then green jelly layers. This was always fun to eat (even though there was no great difference in the flavours). One of the great things about parfait dishes is that you could look at the transition between one colour and the next. I was always fascinated about how the colours bled into each other at the boundaries. Maybe that's what sparked my interest in species! I was reminded of this childhood delicacy while reading about some recent research done in the department by Rob Cruickshank and Dave Pontin. Dave recently completed his PhD looking various aspects of bluebottle jellyfish (Physalia, often known as Portuguese-men-of-war). 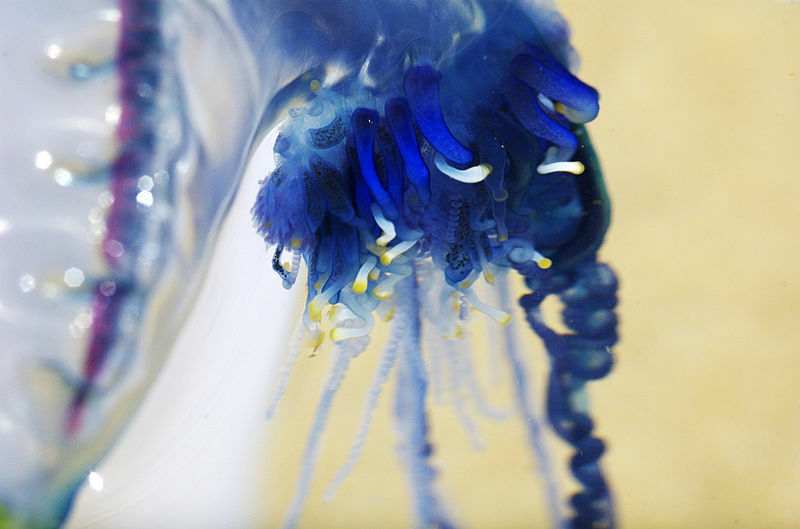 This genus of jellyfish inhabits most of the world's oceans. It has an unique trait of an inflatable bladder or sail with which it lives at the surface of the ocean. It is also known, and feared, because of its potent sting which is dangerous to human swimmers. There has been some debate about how many species of Physalia there are, stretching back over 200 years. When your study animal is made out of 'jelly' there are not a lot of useful traits to identify species with. 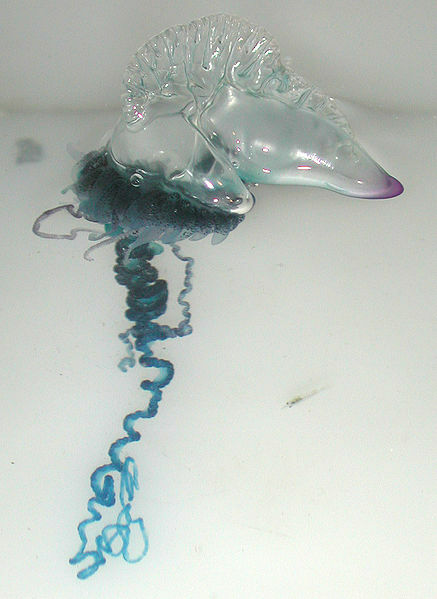 For many years, biologists have speculated that there are few barriers for bluebottles around the oceans and so we might expect to see a widespread species. There is certainly some variation in size and shape around the world, however, and a second species is often assigned to the Pacific. Luckily, DNA can be used to sort out these problems as it is not mislead by bland appearances. Rob and Dave obtained samples from specimens washed up onto the beaches around New Zealand, Australia and a couple from Hawaii. Two different gene regions, the mitochondrial CO1 and the nuclear ITS, were sequenced and they have published their results in Hydrobologia. Both types of gene data found three distinct 'clans' within the New Zealand samples, although each clan was for a slightly different group of individuals. The amount of difference found between these groups was large, certainly indicating that there are cryptic species in Physalia. With the mismatch between what the two genes are saying, Rob and Dave can only infer that this is a species complex at this stage. Like my traffic light jelly when I was a kid, where it was difficult to tell exactly where one colour stopped and the next began, at this stage it is difficult to show exactly where the boundaries between these jellyfish species are. Although the answers are not as clear at this stage as Rob and Dave would like, this study does have important implications. If there are, potentially, three species in the New Zealand region alone, then there may be considerable diversity that has gone unnoticed around the rest of the world.... lots of hidden flavours of jellies!